Myopia means you’re “nearsighted”: you can see clearly up-close but can’t see things clearly far away. Myopia occurs when the eye grows too long from front-to-back. People who are myopic usually need a stronger prescription every year until they’re between 21 and 26 years old. Increasingly, however, some people continue to get worse beyond those ages. Doctors used to believe that myopia was genetic. However,mounting evidence suggests that it has more to do with what we do rather than with our genes. We use the muscle inside our eyes, called the Ciliary Body, to focus on things up close. When the muscle is completely relaxed, we’re supposed to see clearly far away. Studies show myopia is related to how much time we spend looking at things up close like iPads, smartphones, and computers. If we’re nearsighted, that muscle doesn’t have to work as hard to see up close. It seems that our eyes grow longer in order to reduce the work those muscles have to do. Can We Stop or Slow Down Myopia? Yes! Murrieta Optometry offers the 3 most successful methods of slowing down or stopping myopic progression, known as Myopia Control. Patients whose prescription has increased in the last year or who simply want to stop getting worse are good candidates for Myopia Control. Myopia Control doesn’t fix your vision: you still have to wear glasses or contacts to see clearly. But it can keep you from getting worse. 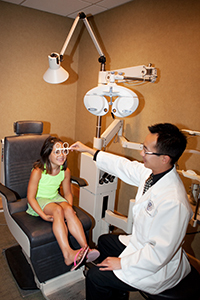 Here are some details about each of the 3 proven Myopia Control Methods. Ask a staff member or make an appointment with your eye doctor to discuss which one may be best for you. Also known as CRT or Ortho-Keratology, it uses custom-made contact lenses to re-shape the cornea to improve vision. CRT contacts are only worn at night, while you sleep, acting like a retainer. They are comfortable and are removed in the morning. Vision remains clear throughout the day and you don’t have to worry about glasses or contacts for school,work, or any activities. One drop of Atropine in each eye before going to bed at night can slow down or stop myopia. The drops don’t hurt, don’t blur your vision, and are safe for long term use. Side effects are rare, minor, and stop when the drop is discontinued. Patients still need to use glasses or contact lenses to see clearly, but they should stop needing stronger glasses every year. These contacts are designed to correct distance vision while reducing the effort required to focus up close. They are soft, disposable lenses that come in daily, 2-week, and monthly replacement schedules. People who use these lenses are much less likely to experience yearly changes in their prescription. Ask your doctor whether one of these methods is appropriate for your child or even you. Make an appointment for a free consultation today, even if you’ve had an exam in the last 12 months.